The Garmin TT15 GPS mini dog tracking and training collar is the extra small dog collar for the Garmin ALPHA 100 GPS Dog system. TT 15 mini dog device uses 18 levels of continuous and momentary stimulation, plus audible tone and vibration activated from Alpha® 100. Compatible with Astro® 430 for tracking only. Rugged and water-resistant to 10 meters, this tracking and training dog device with collar is tough enough to run wherever your dog runs. The stimulation features let you train each dog separately — traditional stimulation allows you to make quick changes (low, medium or high) within a predetermined stimulation level (1-6), whereas linear stimulation allows progressively more stimulation from levels 1 to 18. You can remotely operate the LED beacon lights, built in to the dog device, to help locate your dog in low-light conditions. Track and TRAIN up to 20 dogs (require extra TT15 mini or standard TT15 collars). It is fully waterproof - IPX7 rating (up to 10 metres under water) and rechargeable with 4 hours fast charge battery. The Garmin TT15 mini collar has 18 levels of continuous and momentary static correction with tone and vibration only stimulation. It also has a built-in remote operated beacon light to help pig hunters locate their dogs at night or in low light conditions. The beacon light is visible for up to 90 metres. The Garmin TT15 mini collar has built in Standard GPS satellite receiver as well as the GLONASS satellite receiver. The GLONASS is the Russian Navigation Satellite System which has 24 orbital satellites. It is the second alternative navigational system in operation with GPS. It means this Garmin TT15 mini collar is able to receive 24 more satellite signals than other GPS dog tracking collars. It is very unlikely that this TT15 mini collar will lose the signal. The GLONASS helps you to locate the dog much quicker and has much better signal strength even in heavy cover. 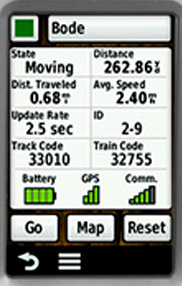 The Rescue Mode increases the amount of time before a collar battery dies. This allows more time to find and recover the dog. This mode can be activated automatically or manually. When it is manually activated, the collar’s update rate will drop to every 2 minutes to ping the ALPHA handheld to extend the battery life. The Rescue Mode stays on until it is turned off. When the battery of the collar drops to 25%, it will be activated automatically. Click the button below to add the Garmin TT15 Mini GPS Dog Track and Train Collar to your wish list.